Here at Elloise India Weddings, we offer a great team of friendly, professional, mobile wedding hair and makeup artists, who are happy to travel to any location including country houses and hotels. Our aim is to ensure your day is an amazing and memorable experience. 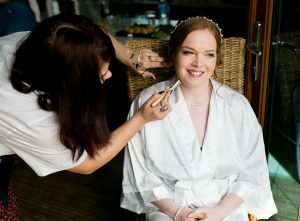 All of our wedding hair and makeup artists are highly experienced and have worked alongside industry leaders. They are all self employed and are fully qualified and insured. It is the responsibility of the client when booking their wedding hair and makeup artist to pay the 50% deposit to secure the wedding day appointment. They should also book their trial appointment immediately, ensuring they remain outside the 10 week boundary, set out in the terms and conditions. This is a mandatory requirement to remain eligible for a full refund, should they have a trial and not be totally satisfied with the wedding hair and makeup service they receive. In the event that the client is unable to make the trial appointment with the stylist outside the 10 week period, they should inform Claire Wallace Hairdressing immediately. In the event that a client wants to book a wedding day appointment at short notice and the date is still available, providing a trial appointment is made immediately from the time the deposit is paid, the client is only eligible for a 50% refund if they are not totally satisfied. At anytime a client is dissatisfied with the trial service and has paid a deposit to secure a wedding appointment, the client reserves the right to cancel the booking if done within 48 hours, providing they abide by the terms and conditions. Please see our wedding hair and makeup terms and conditions.